The site of Pilston's almshouse as annotated in the centre of this image. Newtown Road is across the top, while South Street runs north-south on the right. OS map 1901. Courtesy of Hertfordshire Archives and Local Studies. The history of this establishment raises a number of questions. According to Henry Chauncy, there were benefactions before the time of Henry VI. In 1433 Thomas Halsey passed property on to John Leventhorpe and his descendents, who passed it on to Richard Pilston of Great Bardfield. An Act of 1531 (in the time of Henry VIII) ruled that every parish had to keep its poor by means of charitable alms – money given voluntarily by those most able to afford it. Churchwardens’ accounts of 1547 show that William Norfolke paid 4d. (2p) rent ‘for Almshouse gardyn for half a yere’. The almshouse mentioned was built for the poor of the town on the south side of the market place. In 1572/3, the 15th year of Elizabeth I’s reign, Richard Pylston gave two almshouses in Peter’s Street, a stall in the Fish-Row, a meadow called Church Mead in Thorley containing one acre, and the yearly rent of 11s 6d and Cummin issuing out of certain lands and tenements in Stortford, called Bevens and Leventhorpe’s Rents, to the poor dwelling in the almshouses. Chauncy suggested it was originally the gift of Bever and Leventhorpe, and that Richard Pylston’s name was used as the heir of the surviving trustee. In other words, the almshouse may have been the one mentioned in the 1547 accounts but named after Pilston in 1572 as the trustee at the time it was officially left to the church. 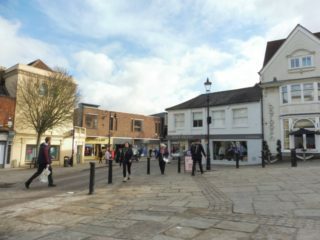 Peter’s Street does not seem to appear in Bishops Stortford maps, but Potter Street heads south from the south east corner of Market Square. 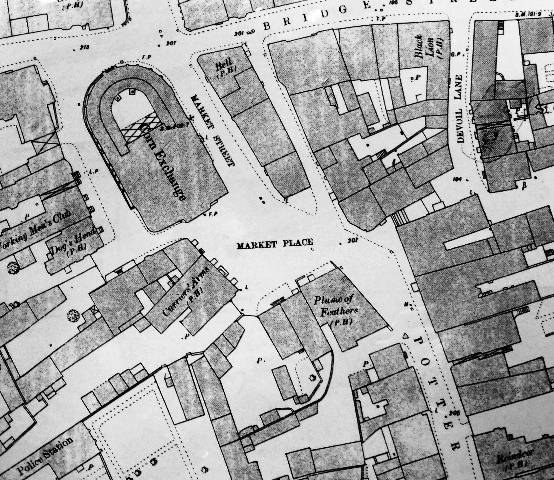 Shown as such in the OS map Essex XXII.15 (1st ed/rev 1862-96), part of it is named Market Street. This agrees with the above note that the almshouses were on the south side of the market and the reference to fish market shops used as residences. To further confuse the issue, a cutting collected by Gerish refers to Porter’s Street. Moreover, the local church is St Michael’s, not St Peter’s. Care needs to be taken as the extents of Market Street, Potter Street and South Street varied over time. Maybe the almshouse, consisting then of two tenements, was at the northern end of Peter’s Street (alias Potter Street, later Market Street?). Jacqueline Cooper notes that in the sixteenth century two Fish Market shops had been left by Richard Pilston to the church and poor to enable ‘the most honestest of the said poorest sort to have their dwellings in the said two tenements’ – a sort of almshouse charity. But the commissioners found that the shops had been sold, probably in 1675, by the parish officers for ‘a valuable summe of moneye and ye moneye imbezelled or misemployed’. However, had they been sold, they could not have been exchanged in 1821, about 150 years later. Either they would not have existed or would have had new owners. 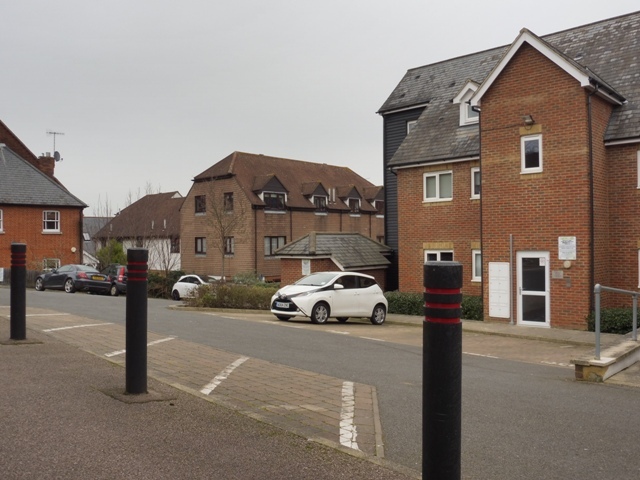 Unverifiable explanations could be that other shops used as a source of income, not the almshouses, were sold or that the poor lived above the shops, the shops being sold or leased while the upper floors were kept as almshouses. According to Victoria County History, five almshouses at New Town were acquired by exchange under the Inclosure Act 1821 for the two tenements originally given by Richard Pilston. The income, along with some other charities combined into the Poors Estate, was applied in the upkeep of the almshouses, which are inhabited by poor aged women in receipt of parochial relief, and in the distribution of coal to the poor. Note the different requirements from the Market almshouses. They are shown in the OS map Essex XXII.15 (1st ed/rev 1862-96) as being to the south of the Baptist church. 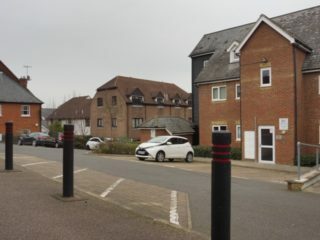 The site is now (2018) Archers Place. An auction notice by Sworders dated 1871 states that the 4 buildings for sale were near the almshouses, indicating the almshouses were near the property for sale. Not too helpful at first sight, but the OS map Hertfordshire XXIII.10 (Bishops Stortford; Great Hallingbury; Thorley), revised 1896, published 1898 does indeed show two blocks of 4 buildings near a block of 5, indicating the almshouses are on the site just south of the Baptist church. Sometimes it is not clear from the OS labels exactly which building is referred to. 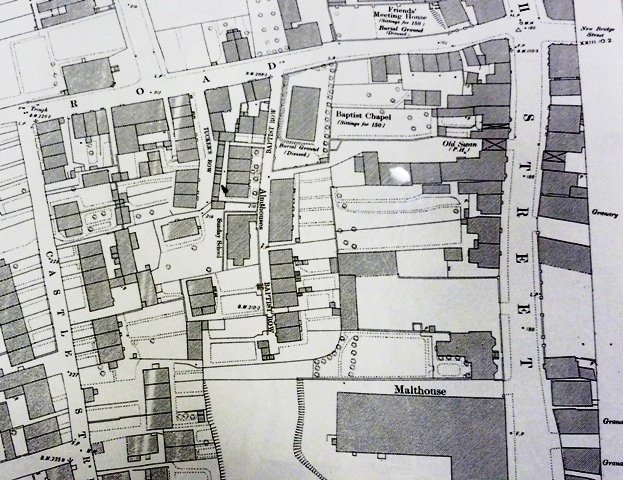 The 1901 OS map shows the location more clearly, and includes what look like gardens for the almshouses. They are also shown on the 1915 (pub 1921) revision, and on the 1939 (pub 1947) editions, by which time the adjacent block of 4 had been removed, indicating the site had been reviewed. See above for original location in Peter’s Street. Vol I 1700 2nd ed 1826 pub Kohler & Coombs, Dorking. This publication been digitised by British History Online (BHO) and is available online. Date: nd [1895 – 1915]. This is a collection of cuttings. Description: Trustees of “Coach & Horses” Friendly Society. 4 messuages and gardens near the almshouses, in New Town. Description: Stated to be called Bever’s and Leventhorpe’s rents and anciently the gifts of Richard Pilston, 1784 – 1796; 1822. The money was collected by the overseer and applied in the same way as the Great Poor’s Rental. Original bundle. It includes references to the workhouse but not to an almshouse. This page was added on 28/01/2019.